The Angels are STILL singing! 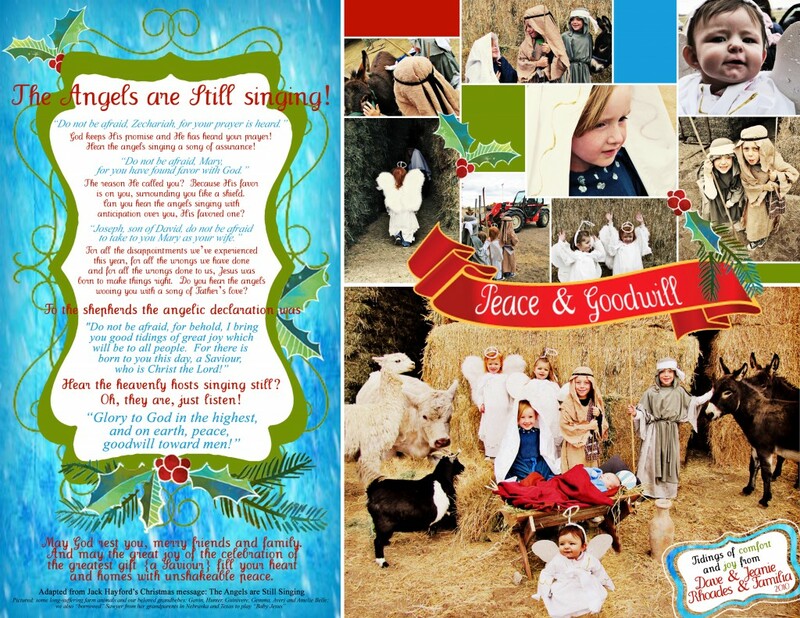 True confessions: My Christmas card “greeting” this year is shamelessly ripping off Jack Hayford’s Christmas teaching, “The Angels are Still Singing” because I so LOVE this timeless message. Dig it, friends and familia! The angels of the Lord are near. Listen for the song – it’ll be good news for sure. Did you notice how often the angels said “fear not”? This image was captured in early November at a nearby farm (remember the world’s largest corn maze?!?) Gavin 7; Hunter 6; Guinivere 5; Gemma May 3; Averi-J 2 1/2; Amelie Belle 7 mos. ; Sawyer 3 mos. Merry Christmas, PEACE and GOODWILL to you and a very Happy New Year! ~ from the Rhoades family! How wonderful to be a part of GOD’S Great Family! Shameless or not, The message is still true! May God Bless and keep you and yours on this Christmas Season! May the Lord of our Salvation Bless and keep you and Shine through you this season and all year long! Helen and I Love you Very, Very Much! We pray blessings and Love for you this year! LOve , love, love it!!! Merry Christmas to you too!!! Your grandbebes couldn’t be any cuter! And the message you wrote is powerful!